How did you get started in theater? I began my love affair with the theater in high school. I always sang. I came from a family of eight, with all the mayhem that implies. There was always singing and music. I was always mimicking Streisand. I was actually very shy. I grew up in the suburbs of Washington, D.C., and went to a Catholic girls’ school. I started doing musicals at a boys’ high school, St. John’s Military School. My friend Michelle Meloni – who’s the sister of Chris Meloni, of Law & Order SVU – was going to audition. We auditioned for Hello, Dolly! She got the lead, and I was in the chorus. I did four shows there. It led me out of my shell. I knew the theater was the way to go. 'Falsettos' on Broadway: Heather MacRae, Carolee Carmello, Stephen Bogardus, Sivan Cotel, Chip Zien, Barbara Walsh (in front) and Michael Rupert. 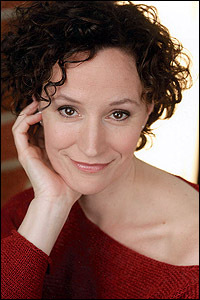 After high school Walsh worked backstage in summer stock and then did theater at a two-year college, Montgomery College in Maryland. She moved on to three years of dinner theater, where she played leading roles, served cocktails and gave people their checks. At the Wagon Wheel Theatre in Warsaw, Indiana, one of her jobs was cleaning out the men’s urinals – a job she shared with fellow starving artist Faith Prince. 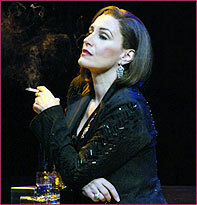 Walsh got her Equity card at the Lincolnshire Theatre outside Chicago, and in the fall of 1980 she moved to New York. 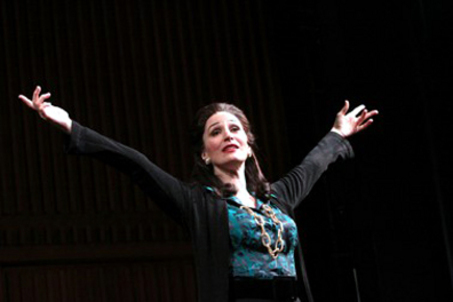 Did you have drama teachers or mentors who guided you along the way? A lot of what I learned came from the dinner theater – playing really diametrically opposed roles. The summer job I had between high school and college was at the Homestead Inn in Hot Springs, Va. I was sewing, doing props, cleaning. But I worked with an actress named Ronnie Claire Edwards, who was on The Waltons. I saw her play Bella Manningham in Patrick Hamilton’s Gas Light [known as Angel Street in the U.S.]. This performance was just so inspiring to me. I loved the drama. I wanted to play that role. It inspired me to want to act. I had one acting teacher I didn’t care for. I found him really manipulative – taking an actor’s insecurity and making it worse. I thought it was gratuitous on his part, and I let him know it. I had an extraordinary voice teacher for 33 years. Her name was Margaret Riddleberger. Her principle of singing was about physics, about blowing air. If it goes the right place, then you’ll have a tone that’s never-ending. What I loved about her technique is that when I’m singing I don’t have to think about it – I just act. That’s the beauty of it. I see singers who are so focused on their technique that they’re not connecting to what they’re singing. When you did Master Class, what did you get out of Callas’s relationship to her students? What does she teach them? That play is very special to me. I took it when someone else dropped out, and I learned the whole role in two weeks. It’s really the story of a woman who can’t sing anymore. I never thought I’d ever play it. But when I played Joanne [in Company], people started thinking of me differently. I went full-tilt into research. It was a real pressure-cooker situation. I told myself just to be open. I knew very little about her except that she was married to Aristotle Onassis – or not married, but connected to him. What I found was this extraordinary woman with an unbelievable life story. She had a sharp, dry demeanor. The most inspiring thing was the work ethic. That’s what she’s trying to get across to the students – the beauty of the work. And that’s what I try to get across to students. She’s a sharp, hilarious character. She’s very tough with the students. Then the play goes into memory, and she becomes this quiet, vulnerable, deeply wounded woman. My voice teacher got to see me do it [before she died in 2009]. She was very tough on me. There was no BS, no kid gloves. She was more proud of me doing that role – a non-singing role … That was the last day I saw her. What do you take away from giving master classes? What’s so moving to me is the openness of younger people. I think people are looking up to me – how did that happen? [She laughs.] It’s very moving to me to see people so open and so ready to learn. As I look back on how I’ve developed, the desire to do it and to be known was so large that it kind of interfered with my work. Right now it’s more about the work. I care less about what people think. I hope it’s a universal thing that just comes with age. There absolutely is confidence and strength, and I have more faith in my choices. John Doyle [director of Company] said to me that just because you have those colors doesn’t mean you use them all. Restraint is often a better choice. What roles have meant the most to you, and what roles would you love to do? 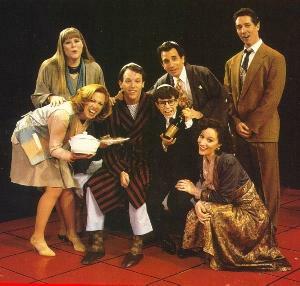 Falsettos in 1992 was an unbelievable gift of a job and a role. People still stop me and say how much that play meant to them. Definitely Company is up there, and also Normal, a show my husband directed, about a mother dealing with her daughter’s anorexia. I would love to do Chekhov – Madame Arkadina [in The Seagull] or Ranevskaya [in The Cherry Orchard]. I may be a little old for it, but I’d love to do The Rainmaker or 110 in the Shade. I love that character. Mamma Rose is something I could take on. I had the potential to audition for Mrs. Lovett but I passed on it. I don’t have a hankering for it. Maybe Tennessee Williams – The Glass Menagerie. I would love to originate [ new roles]. Who knows what’s around the corner? In all honesty Master Class is my best work. Maybe it’s because I had to give over to do it so quickly. There were none of the usual walls I put up. So it taught me so much on how to go forward. Just dive right in and you will be rewarded. The more you put out there, the more you gain. This entry was posted in Arts education, Broadway, Celebrities, Uncategorized and tagged a little night music, Barbara Walsh, Big, Broadway theatre, company, Falsettos, Grey Gardens, Jack Cummings III, Maria Callas, Master Class, Nine, ragtime, Ronnie Claire Edwards, Starving Artist Studios, Theatre, Tim Evanicki. Bookmark the permalink.